Group: Splits the data using this column (much like Person or Project). This is useful for columns you wish to use to filter or group analysis. Ignore: Do not use this column to create month data. Use this for purely informational columns (such as Comments). Setting the Transform to Group will also stop the timesheet from warning you about duplicate entries when this column contains unique values. 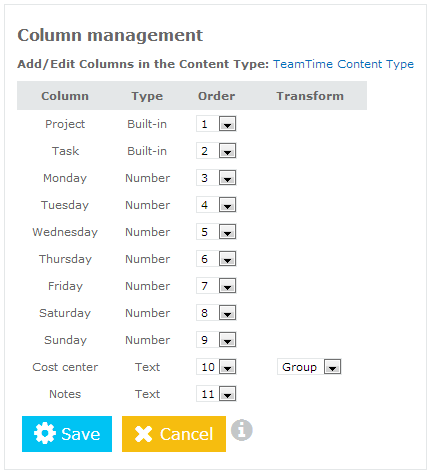 To add, edit, or remove columns from the timesheet, follow the link at the top to directly access the TeamTime Content Type.